Despite spending an awful lot of my adulthood trying to come up with the meaning of life, I haven't spent all that much time analyzing my fellow hobbyists. Instead, I've relied mostly on my own passion for gaming and assumed other felt as I did. Still, you would think the desire to understand other gamers would be a natural pursuit for a game store owner, but the day to day activity is enough to keep me busy with questions of the big unknown. Will they buy it? What exactly do they want? How on Earth will I pay the rent and the employees in the same week? Nuts and bolts questions can bog you down to where you stop thinking about the psychology of gaming. I can't even call it the "big picture," because the big picture nowadays is mostly a strategy to keep the doors open. I leave the whys and wherefores to game designers, although I've always known that kind of insight could be invaluable. So when I saw this months issue of White Dwarf's Standard Bearer column with "hobby pies," I had one of those "ah-ha" moments. Someone gave the why question some thought. The concept is simple. Each of us engages in the hobby for a variety of reasons, with priority given to some elements over others. Everyone is different. Everyone has valid reasons. For the miniature gamer, the hobby pie in the article included: gaming, painting & modeling, collecting, background and camaraderie. Jervis Johnson and Mark Lathum, well known GW developers, both had very different pies, meaning they looked for different things in their hobby experience. There's even a Dakka Dakka poll modeled after this article. In a way, I felt this article gave me permission to engage at whatever level I wished to in the areas that interested me. For example, I do little actual playing (more lately), but very much enjoy the painting & modeling, as well as background through reading the novels. I felt a little guilty for my lack of interest in playing, but this analysis is saying that's just fine. I probably have 3,500 points of Imperial Guard painted up, but I've only played around 15 games, and never over 1,500 points. I play Dungeons & Dragons primarily for camaraderie, and as my friends have drifted away from that game, I've found the game less of a focus. I hadn't realized why until I read the article. As a store owner, I now see that my contribution to my hobbyist crowd is often providing that opportunity for camaraderie as well as the opportunity to game. It's not the only focus though. Our email service tracks who opens store email broadcasts, and half the recipients on our mailing list never even open event emails. That's perfectly fine. It's not what interests them; it's not what they want from us. Yet, events are a very large percentage of our time and resources; store owners need to remember it's not everyone's focus when they plan their time. It's not all about events and game center schedules. For clearly half our customer base, what we provide is what they clearly engage in as customers, what we claim to be our core competency: the stuff. The stuff, available now, in a clean, well lit, safe store, with helpful staff. 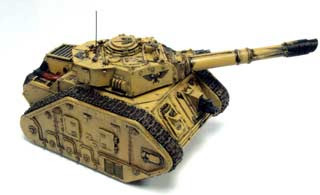 I really like the idea of the Leman Russ Vanquisher. I especially like how its modeled, it being the only tank that looks like my idea of a real tank. You can get some extended barrels for the base Leman Russ from Forge World (on order), but the nice thing about the Vanquisher is it's meant to have a long barrel with huge range. Yes, you could probably make some Freudian analysis of this, but really, who doesn't want a very long protuberance? In 6 turns 3 of its shots will hit, 1.5 of those will be ignored by whatever cover the enemy tank is in, and then you'll get slightly more than 1 damaging hit, none of which are going to score a 5 or 6 on the damage chart. The Vanquisher is a waste of time. You can always create the Paskuisher, by putting the special character Pask into a Vanquisher. This improves your chances to hit to 66% (BS4), at an enormous cost, especially in a low point value game. It's an attempt to compensate for a fatal flaw. White Dwarf 354: Includes a great preview of Planetstrike. Litko 40K Tokens: objective markers, infantry markers, damaged vehicle markers, flaming wreckage markers, gone to ground markers, assault templates. Amera Plastic Mouldings: Inexpensive terrain pieces, ready to paint: Trench set, bridge set, bunker set. Flames of War: Kommisar Dedov, Captain Nevsky, Wiking and Totenkopf gaming sets. Smoke & Flames restock. Mid-War Monsters preview copy. This Chapter Pack, the second in the King’s Landing cycle for the A Game of Thrones Living Card Game, provides context and depth to the new Shadows mechanic while taking a close look at some of the trials and pitfalls that can cross up the most carefully laid plans. Gold Cloaks, Tears of Lys, Stormdancer, Moonboy, and The Hound are some of the highlights of this exciting release. Monsters Menace America: Back in print! 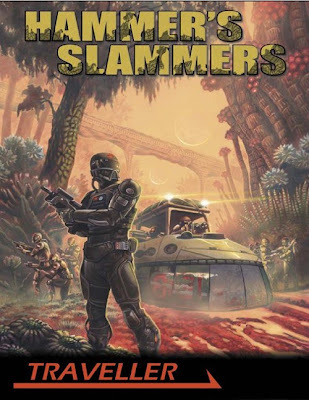 Based on the novels and short stories of David Drake, Hammers Slammers introduces players to the tank crews and specialists within the best known and most capable mercenary unit in the galaxy! This Traveller sourcebook is packed full of the history of the Slammers, the weapons, vehicles, and tactics they use, plus new careers and a series of missions to get you started. AD&D Core Books (used): Mint condition! Along with some mint condition adventures and the DM's screen. Our sales our up for the year, despite a dismal June. That's my disclaimer so you don't think this post is all about me. I wanted to make an observation about small business failure. Right now, the usual small business exit strategy doesn't work due to the economy. Most small business owners with struggling businesses in normal times, would throw in the towel at a certain point. The failure rate is high, and it doesn't get easier over time (a frightening statistic). Throwing in the towel would be especially attractive to many right now, especially with housing values on the decline and credit card companies applying the thumb screws. Nobody loans money or signs leases with small businesses, they loan money and sign leases with small business owners. So if your house has negative equity, throwing in the towel, aka bankruptcy, solves a couple of problems. That's what we saw at the beginning of the recession with many businesses falling like dominoes as owners went back to working for others. You don't see that as much any more. Why? Unemployment. There is no quitting your interesting experiment in small business and going back to your day job, because there is no day job. Small business owners are now in it until the wheels fall off, until the doors are padlocked by the landlord, the credit cards don't work and the employees stop coming because you haven't paid them. The exit strategy has failed. It has met the enemy, an economy with a stratospheric unemployment rate. The new strategy, which includes most, if not all small business owners, involves rolling up the shirtsleeves and re-assessing what they're doing. I personally find that somewhat liberating. We often have a tyranny of choice in our society. This focuses small business owners like nothing else could. Americans are extremely strong and resilient once they know what needs a doin'. 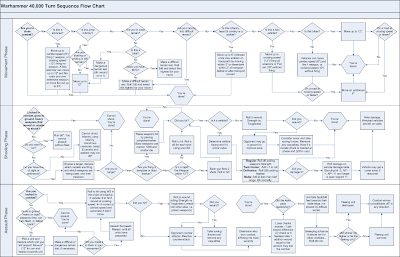 I made a flow chart of a 40K turn to get a better grasp of the rules. I'm not sure if it's of any use to others, but I felt I learned a lot making it. That said, 40k is all about exceptions to the rules. It's what makes the armies different from each other. If you're the kind of person who wants to know all the rules before playing, this can be maddening, as you would need to read every codex. Believe me, there are plenty of people who do this. The flow chart is generic (it's the only way it could be made), so new players who might use it should know how their army makes exceptions to the rules. Let me know if you see any obvious errors or omissions. I intentionally used the rulebook only, ignoring codices. You're free to do whatever you want with it. It was made in Microsoft Visio, so ask if you want a copy. It was formatted to print tabloid (11x17). One of our volunteers, Aaron, is going to be taking over the Wednesday night 40K campaign. The next campaign will include the Planetstrike rules. We've got a full schedule of games for this Saturday. Please RSVP via email or in the store to reserve your spot. There are plenty of spots available. Warmachine: The bins of 20% off product are now 40% off in hopes of clearing it out. This is stuff that hasn't sold in over a year; a lot of it good and perfectly valid for play. We're planning to drop about a quarter of Warmachine based on flagging sales. I still think this game has a lot of strength in it and it's not going away anytime soon. Really, I promise. Privateer just needs to learn that they'll eventually need to pull back their skus, much like Games Workshop does now. You can't have limitless growth and expect retailers to carry the full line indefinitely. So Privateer, remember the Games Workshop complaint about SKU creep? That's you now. Warhammer 40K & Fantasy: We've taken all of the slow selling blisters with duplicates and slashed the dupes by 40%. They're in baskets for your perusal. This frees up inventory dollars for our two most popular miniature games without limiting selection. We carry every SKU for Warhammer 40K. If you don't see it on the shelf, ask us. If it's missing and not out of stock, I'll give you a mint. Alkemy Clearance. We threw a lot of stuff up against the wall at the beginning of the year to see what would stick. Infinity stuck, for example. Alkemy did not. The Alkemy product isn't even in my time thresshold for clearance, but it's on the wane and I'm low on space. Beautiful models; not a lot of play in the store. Enjoy. Reaper: The Reaper basket was refreshed a couple weeks ago, but you can still find a lot of good bargains here. Reaper is a sad story that I'll share with you. People just aren't painting miniatures for role-playing games like they used to (you could say that about RPGs overall). It's as simple as that. We used to sell EVERY single Reaper miniature and it was a point of pride. We even had those big dragon box sets, Exalted and Legend of the Five Rings. Somewhere around 2006, something happened. I think the D&D pre-painted miniatures hit a critical mass of quality or maybe we hurt Reaper sales by selling D&D pre-painted singles. Reaper sales tanked and never returned. We now sell a LOT of character models mostly and some monsters. The problem with Reaper inventory is that sales directly relate to available inventory like no other game. This is not true anywhere else in the store. I can drop the bottom performing 25% of any product line without seeing a significant decline in sales. Reaper is one of those lines where customers buy equally across the line, even the poor performing stuff. Just because a female ogre with a baby on its back only sells once a year doesn't mean the average Reaper customer doesn't want one today. If I cut Reaper inventory by 25%, sales decline 25%. It might not be a bad trade off for the store, but it's sad if you like Reaper. I just thought I would share my strange story. As an aside, we can special order anything in their catalog, usually for next day delivery. SBA ARC Loan. Griffin shamed me into doing the legwork, so I'm calling all the banks in the Bay Area looking to see who is participating. The program starts today. Maybe I'll shame those who won't. Leman Russ Project. I ordered the parts from Forge World yesterday, thinking I had a little cash. Little did I know my car registration payment was late and the penalty equaled my Forge World order. Doh! Summer is Here! Come play with us! We're a great place to play during the day. The tables aren't any busier than normal. Turnout in the evening is even better than normal, so you've got lots of opponents. Free RPG Day is Saturday. We've got four gaming sessions going, including a couple D&D 4, D&D 3.5, and Geist from White Wolf. Come check it out! Free stuff includes an Eberron 4.0 adventure, Pathfinder bestiary, Geist, Rogue Trader for the Warhammer 40K RPG and much more. Did I mention the free part? Kids of Carcassonne: (2-4 players, ages 4 and up). New Hasbro games: Clue: Carnival, Monopoly City, The Game of Things, and a re-done Boggle. Blue Orange Games: Gobblet Gobbler, Chickyboom, and YamSlam (great kids games). Players try to bring the city-states of ancient Sumeria to the fore. Each turn, players boost the importance of one of the city-states by flooding it with their traders, boosting its power. Each time a city-state gains power one or more will lose power, the aim is to gain control of the pre-eminent city-states during the scoring rounds at the end of each dynasty. Players have to time their movements, as a city-state can quickly lose favour too. Pants on Fire: party game for 2-6 players. 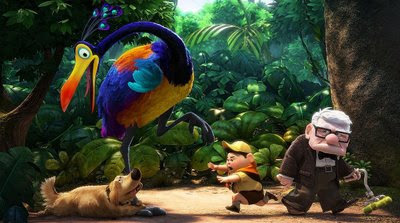 Players are given 3 different generic descriptions of feelings or situations. They then write down events from their own lives that match the 3. But, of the three, 1 must be true, 1 must be a lie, and the third can be either true or false. Each player then tells his stories, and the other players try to determine which ones are true and false. They score points for guessing correctly. 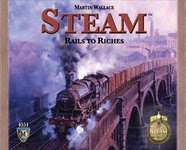 Steam, by Martin Wallace comes out tomorrow. This is the most anticipated board game of the season (currently hovering around a 9 out of 10 on boardgamegeek). Dungeons & Dragons: Eberron Player's Guide, Arcane Towers dungeon tiles (very pretty), and Kingdom of the Ghouls (adventure for levels 24-26). Champions: Book of the Machine and Lucha Libre Hero (due tomorrow). 40K Planetstrike: the store copy is on display. The book goes on sale June 26th. 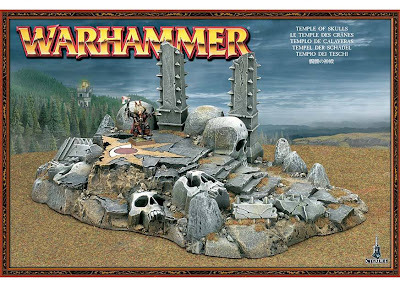 GW Due Friday: War of the Ring Galadhrim knights and warriors, Fantasy Temple of Skulls, and the Empire Battalion box. Misc: Zombiesmith zombie miniatures, Armorcast re-stock, more Infinity, new Reaper minis tomorrow. 36-card starter deck (33-card Horde deck featuring all new Death Knight content + 3 Ghoul token cards), plus a 17-card Death Knight pack. Also includes a rulebook.Includes a random 33-card Dark Portal pre-constructed deck! I really like the colors of our two armies as they fought to a draw tonight. Michael Usi's space marines ripped apart my Tallarns, but Al'Rahim's platoon snuck up from behind and wouldn't budge. This game taught me I need those Leman Russ tanks to overcome an army like this. The marines ripped through transports and basilisks like they were made of paper. It started with a drop pod of marines. I knew it was a distraction, but it wasn't one I could ignore. Vehicles were easily destroyed by various bombardments, but the guard still fought back well enough to stay in the fight. In the end, the only scoring units left on each side contested one of the five objectives. This guard squad hid in a building until the final turn. The rest of the platoon was caught out in the open and eviscerated. My Forge World parts arrived so I started work on my last of five chimeras. The fenders were a big disappointment, as the casts were poorly done. In the end I had a distinctive command chimera, even if I was the only one who could tell the difference. It's not a date on the calendar or a change in the weather, it's when the local schools are out for Summer break, and it started for us on Thursday. Although I think US school kids don't stay in school long enough, their early release is always a big boost for the store. Then again, I wonder if we had more intellectually advanced children (they score fairly low internationally), they would be more interested in hobby games that don't include "Madden sticks." It's not just the kids though, we've had a lot of grandparents and parents in over the last couple of days trying to figure out how to entertain their young ones. It was refreshing to be re-introduced to the general public again. They've stayed away for so long. It's important for me, at least, to try to stay upbeat about "things," aka the economy. We've hit a noticeable critical mass of unemployment at the store, where a high percentage of our known customers are looking for work. Still, quite a few lately have come in to say they've found a job. As for the macro economy, the larger picture (the stuff that all economists failed on with this recession), unemployment is supposed to be a trailing indicator, meaning it will correct itself after the economy begins turning around. That doesn't do you any good if you're without a job, however. I think the hardest thing about this recession is all its unknowns. There are so many factors that it's hard to grasp, and psychology is a huge part of our consumer driven economy. It's hard to stay upbeat when most of what I'm reading in the press about the economy are blatant lies and distortions. My theory is that the government and press are working together to boost consumer confidence in hopes of getting the public to spend their way out of the recession. The problem is the major shift in wealth. There will be no easy way out when so much middle class wealth has been vaporized. That's the macro picture again. As for us? Sales were up slightly in May. Hobbyists, myself included, will continue to spend money on their hobby as long as they're employed. It's the creation of new hobbyists that concerns me most, but that's a longer term concern. Summer is finally here and it should help retail stores at least catch up a bit from a slow Spring. I'm still in search of the elusive SBA ARC loan. Nothing will make you a proponent of small government faster than repeatedly seeing good government ideas poorly implemented. This SBA loan program is one of those. Take a good idea, helping small business with a bridge loan through the bad economy, and trash it's implementation. We've seen this with the last two mortgage "rescue" programs and it doesn't bode well for health care reform. The problem, I think, is the compromises that our society requires. If the government used it's resources to administer these programs, they might be effective. There is infrastructure in place now for helping small business in this way. However, private industry and it's powerful lobbies insists on being involved, even when they don't want to be involved. That's the ARC loan in a nutshell. It's a 100% government backed loan that private banks can't be bothered with. It's just too small and not profitable enough, according to my bank manager. Since participating banks are the only place you can get these loans, the loans essentially don't exist. Still, the press makes a big deal about the loan program, with a little side note that, by the way, banks may not want to be involved. The irony is that the more I learn about the ARC loan (the details are elusive) the more I think our business doesn't qualify. It's very much like the mortgage assistance programs. Requirements are so narrowly defined that most people don't meet the arcane qualifications. With the mortgage assistance program, it specified the two mortgage holders you could be with, your current home value range, your debt to equity ratio and a bunch of other requirements. If I'm reading the SBA ARC loan requirements correctly, the store is doing too well for one requirement, but not well enough for another. Figuring all this out is a maddening process. As a business owner, it's my responsibility to investigate all options, but I think the door is fast closing on this one. Distributors have done a very good job over the last couple of years explaining why they don't have something. It used to be just "gone" or a vague rumor that a company was out of business. They would relay this to store owners, making both look like idiots. Now they make a concerted effort to explain exactly why they don't have a product. It's OSM (out of stock at the manufacturer), OOP (out of print), LTD (limited), or NYA (Not Yet Available). A lot of time it's just not there and it might require a more detailed explanation, anything from a sad story about an extortionist Chinese printer to the fact it was ordered two months ago and the company hasn't sent it yet. The Alliance distribution order system will often list something as coming out in 2013, shorthand for "who the hell knows?" I respect this, but as someone who does the same equivocating with my customers, it's really about deflecting blame. If you were omniscient, you would never be out of a product, as you would order enough to fulfill all demand. Omniscience is a pretty high standard, but it's one customers expect of their stores. Online stores often lie about their stock on hand, buying from distributors when the online order is placed. For a brick and mortar store, there's no getting around physical reality. As a store owner, I try to explain exactly why something is gone. I also make a concerted effort at omniscience, such as stocking up on product that's rumored to be going out of print (Pandemic), or that has production problems (Munchkin). This puts me ahead of the curve, but in a purchasing hole. For the most part, I rely on the patience of customers to allow us to special order or seek out alternate suppliers. Some will be patient, while some have no patience at all. I can't entirely fault the second crowd. At least they're shopping at my store first rather than filling a digital shopping cart. Often I'm told I must be mistaken, because the store across town has it. We'll sure, he was just slightly more omniscient than me. Or perhaps the store across town was selling that $4 booster pack for a dollar, and the customer was looking for $1 packs from me. Why do you think the other guy was selling it for a $1? Perhaps he wanted it to go away? The most frustrating thing is when someone is waiting for additional stock to arrive that will never come. For example, they want to buy two Flames of War Panzer III's, but I only have one in stock. If I only sell one a year, I'll never, ever have two in stock. The computer is set up to prevent such madness. Yet the customer waits, like a bad remake of a Samuel Beckett play. Want two? Special order it or buy the one and come back next week when it's restocked. No, he'll just wait. There is a sharp contrast between modern stores like mine and the old school game stores. Old school stores existed before eBay and often have a shock & awe strategy of stocking. The up-side is you become the go-to store. The down side is you've got a million dollars of crap, like hardening plaque in your arteries. A modern store will never be a shock & awe store. Those days are in the past. What makes a modern store successful is that the customers accept the limitations of the modern store and work with the store to get what they need. A modern store needs to be vastly more customer service oriented. There's an admission that they are incomplete, that they are not "full line," that they will never have all the stuff. I think there may be an arrogance that comes with shock & awe. As in, "If you can't find something to amuse yourself in this million dollars of crap, what the hell's wrong with you?" Perhaps there's also not much need to develop customer service when you've hit this critical mass of stuff. You've got a take it or leave it attitude as your store bursts at the seams with product. The modern store will endeavor to have an awful lot of popular, good stuff. A modern store's inventory is like a finely tuned race car engine. It must work to get the maximum horsepower from the smallest displacement. This contrasts sharply with the inefficiencies of shock & awe. Who doesn't want to drive the inefficient muscle car on occasion? I would love to have shock & awe, but there are hard limits of capital that prevent shock & awe from ever occurring. The modern store needs to bridge the gap between that fine tuned inventory and the vast ocean of available product. They need well trained employees that know to offer to special order, that thrive to special order, that encourage and train the customer to work within these limitations. "Next Day Delivery" should be on the tip of their tongues. They are competing not only with the regional shock & awe store, but the ultimate shock & awe, the Internet. They need information systems that take advantage of restock triggers and just in time delivery. Absentee owners don't work well with modern stores, but it seems the norm with shock & awe. These are the advantages and base requirements for a modern store. By the way, add modern practices to a shock & awe store and you've got something really special. Shock & Awe is a dead model. 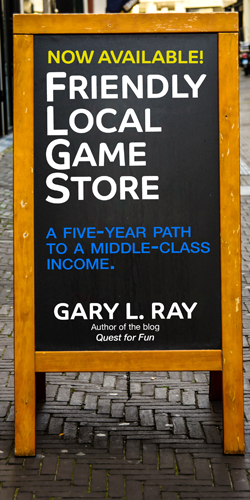 Nobody builds a game store with a million dollars in inventory, on purpose, in the Internet age, in an industry without much growth. It's either a relic from the past or a wildly successful owner that wasn't paying attention over a very long period of time. You don't accidentally find yourself with a million dollars in the game industry, as the joke goes, unless you started with two million. I played a few games of Snow Tails during board game night this week. I was apprehensive, since I generally don't like racing games, but this one was kind of enjoyable, as long as you could keep your left and right sorted out. It's a light, filler game and we played three games in probably an hour and a half. It had that Carcassonne feel, where once you finish a game, you want to dive back in. I had a great time with my D&D campaign; getting that off the ground. The first session went as planned, although it dabbled in a few forbidden fruits of role-playing, especially railroading and deus ex machina. I was walking a fine line. I think it went well though, and like learning grammar, once you know the rules, you can occasionally break them. One of my pitfalls in past adventures is leaving things very free form, where you don't know where to focus as a player. I don't have time for that labor intensive style any longer. I'm making things as clear as possible this time around, including a blog synopsis that includes everything the party needs to know in the context I'm intending. I didn't play 40K this week, but I painted models. I didn't bother documenting the two new chimeras and three melta gunners, since it wasn't anything new or interesting. I do have a project coming up, however, that should be worth checking out. I bought a bunch of chimera bits from Forge World and plan to build a cool chimera for my army's hero, Al-Rahim. I picked up extended track guards with headlights, a heavy flamer turret, a vehicle commander, and an alternate back door. Orr at the store gave me a very cool extended coms bit for the chimera as well. I'll be playing pimp my chimera when the parts arrive in a few weeks. I'm also eying Leman Russ alternates at Forge World. I really hate the Leman Russ. It's a stubby little World War I style tank. I understand the whole 40K background of lost technology and the gothic feel, but this vehicle has never inspired me to want to own one, or use one. Part of it is my armies theme based around artillery, but mostly it's the model. That may change, however, as I've fallen for the Mars Alpha Pattern. It's a bigger tank with a larger back end. It looks especially good with the Vindicator turret. The Vindicator is not actually very good, but I also discovered the Ryza pattern Leman Russ turret, which solves the stubby barrel problem with the tank, another complaint. These may be in my future. I'll probably get three Mars Alpha patterns, one with the Vanquisher turret (tank commander) and two with the Ryza Leman Russ turrets. I might make this a regular Friday thing. So what's new this week? Wizards of the Coast Free Gift Weekend. Buy $15 worth of WOTC product (Magic, D&D, etc.) and receive a free gift: Star Wars minis starter set, D&D Demonweb minis booster, two half-decks of Magic, or The Orc King novel by Salvatore. While supplies last. Games Workshop Clearance. A few items are on sale while they last. The Imperial Guard Demolisher is $34.99 (two), the IG Hellhound is $29.99 (two) and the Empire Battalion box is $55 (one in stock). All three of these are getting updated over the next few months, but they would still make useful additions to your army. We also have the metal Knights of Chaos box on sale for $19.99 (down from $50). Caylus Special Edition: Resin king figure, metal coins, and more attractive board and tiles. Only 1500 are being made and we got one (and likely won't see another). Pack & Stack: A light, filler game ideal for kids. Urban War Rulebook. Several people have expressed interest in this gritty urban skirmish game. Check out the rulebook on our new releases table. I wrote in my purchasing manifesto that you should use credit terms with suppliers instead of credit cards. It was one of those things I preached without practicing, mostly because in the past there wasn't much of a downside. However, in the last year and a half, most distributors have dropped credit cards or include a credit card surcharge on each order. It's not hard to understand why. While retailers get 45-50% margin on product, distributors get around 10%. A 2% credit card fee is like giving away 20% of your profit! I can't blame them for not wanting to accept cards or adding fees. As a retailer, using a credit card for distribution was a double edged sword, and I was getting cut on both edges. First, the credit card companies have been squeezing us of late, interest rates doubling or even quadrupling. Pay even a dollar less than the full balance, which could sometimes hit $15,000-$20,000, and you pay interest on the full balance. Try that once or twice at 18%. When things get tough, the last thing you need are inflexible terms with usurious rates. With consumer credit card protection recently passed by congress, credit card companies are now looking at ways to put the thumbscrews to small business cards, since they lack protection. The writing was on the wall for me: stop using credit cards, especially how I was using them, charging over $150,000 a year with them. The second part of the problem was distributor surcharges. These were between 1-2%, which was adding up to over a thousand dollars a year. This is money just thrown away for the convenience of using a card. Sure, I got miles and sometimes cash back for that fee, but it's no way to run a business. One of my distributors was splitting the fee with me, so they were happy to have me move to terms instead of charging. The other distributor lost me as a customer when they instituted a credit card surcharge and gave me an inadequate credit line. Now that they've adjusted my terms, they'll not only gain back lost business, but they'll capture a huge chunk of new business from a credit card only vendor who charged extra fees. My financing methods were also skewing my purchasing, as I was less likely to go with a non-credit card accepting distributor, even if the terms were more favorable. Finally, somewhat related, we've had our first full month of debit card use. Debit card transactions were 50% of our credit card use in May. This accounted for a savings of nearly $200, well beyond my expectations. Our projections were based on debit cards used as credit cards. What I hadn't anticipated was our incentive to encourage debit card use. That just about doubled our debit card usage, which is a big win for us. If I could think of a way to institute a cash discount policy, I would do that too. This is all nuts & bolts stuff for a small business. Our expenses increase 3-4% a year, but where do we see growth? Right now growth is severely limited, and we're hitting a maturity level in our new location where aggressive growth is less likely. Most businesses are working hard to cut expenses, just to keep their heads above water. Smarter use of credit saves us a lot of money, but it mostly just offsets rising costs. I picked up some Super Gold odorless glue today at Hobbytown. If you thought GW was expensive, try $13 for an ounce of this stuff. I'm not sure what happened to me, but after a couple years of model assembly, regular super glue triggers an allergic reaction. I get allergy symptoms lasting at least a day. Allergies can take a couple years to exhibit themselves, so it's not that surprising. Primer is even worse, but I wear a respirator for that. However, model building projects using glue can take several hours, making a respirator impractical. The advice I'm getting is to work very hard at ventilation and try this type of glue. I was told one guy even built a special ventilation box to build his models. I've got an urge to build more chimeras for 40K, so I may give this a test soon.